The logo even looks like the Vocaloid logo. The story is set in modern-day Tokyo and centers around a group of entertainers working for an agency called Fortuna Entertainment. It follows protagonist Itsuki Aoi, as well as his childhood friend and budding idol Tsubasa Oribe, forceful tokusatsu fan and Itsuki’s classmate Touma Akagi, successful idol Kiria Kurono, half-European actress Eleonora Yumizuru, young ballad singer and cooking show star Mamori Minamoto, and the enigmatic idol and actor Yashiro Tsurugi. 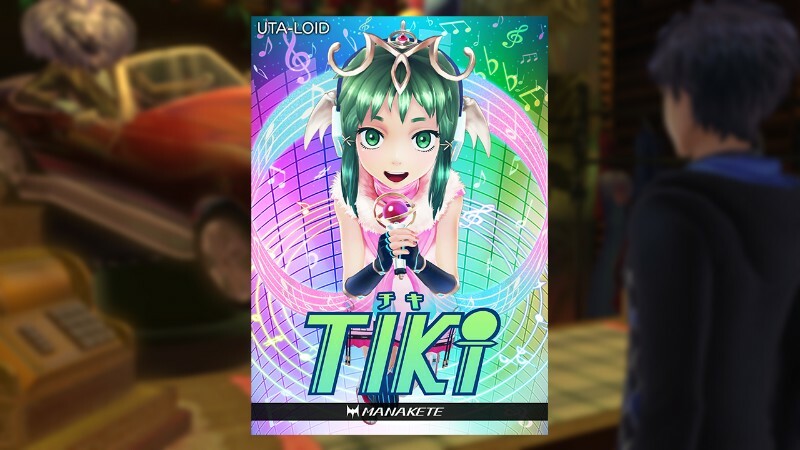 As well as the playable characters, the story stars Fortuna Entertainment president Maiko Shimazaki, American metal guitarist-turned-otaku Barry Goodman, and the Uta-Loid Tiki, formerly a Fire Emblem character and now a virtual singer, similar to a Vocaloid or an UTAU. Fire Emblem characters appear as Mirages, some of which fight alongside the characters as partners and weapons while granting them magical powers, and also as the antagonists. They are all taken from Fire Emblem: Shadow Dragon and Awakening; Caeda, Cain, Draug and Navarre are ally Mirages from the former while Chrom, Tharja and Virion make appearances from the latter. Even more from both games return as enemies. This actually looks like messages I’ve gotten from friends before. It’s a nice touch. The story is much lighter than other MegaTen games, focusing on the enemy Mirages harvesting Performa (creative energy) from humans while the protagonists try to stop them. In doing so, they open up rifts to alternate dimensions known as Idolaspheres, which serve as the game’s dungeons. The inside of the Idolaspheres usually appear as twisted versions of the normal area, aside from certain ones near the end of the game. 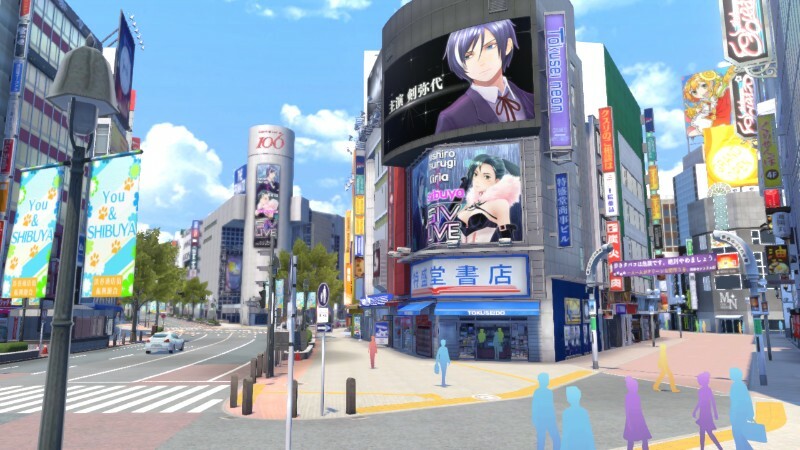 Outside of dungeons, the player is free to explore Tokyo, taking on requests from random NPCs and side stories for the main characters. Side stories lend a good deal of depth to all the playable and support characters, as Itsuki helps them broaden their horizons as entertainers, or just helps them with whatever they’re doing at the time, while learning about their pasts and personalities. 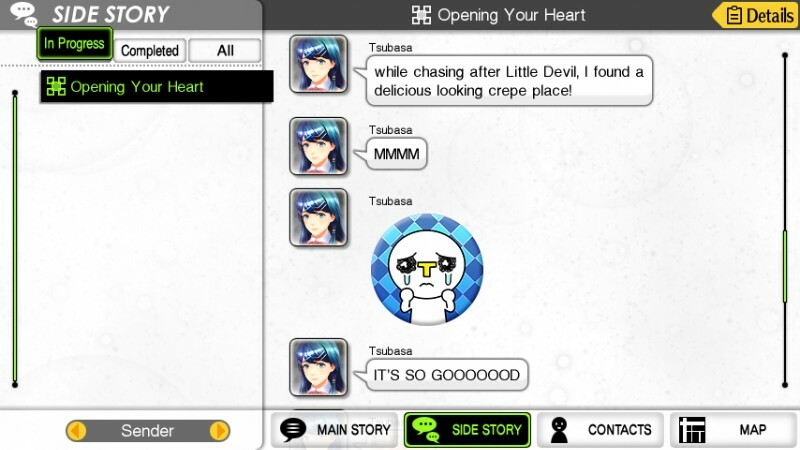 The GamePad screen displays Topic, a messaging app that the main characters use to talk to each other, which helps flesh them out by showing how they talk casually even outside of their side stories. It’s a nice touch, and I actually like the way Atlus replicated the way most people communicate through text in their localization. 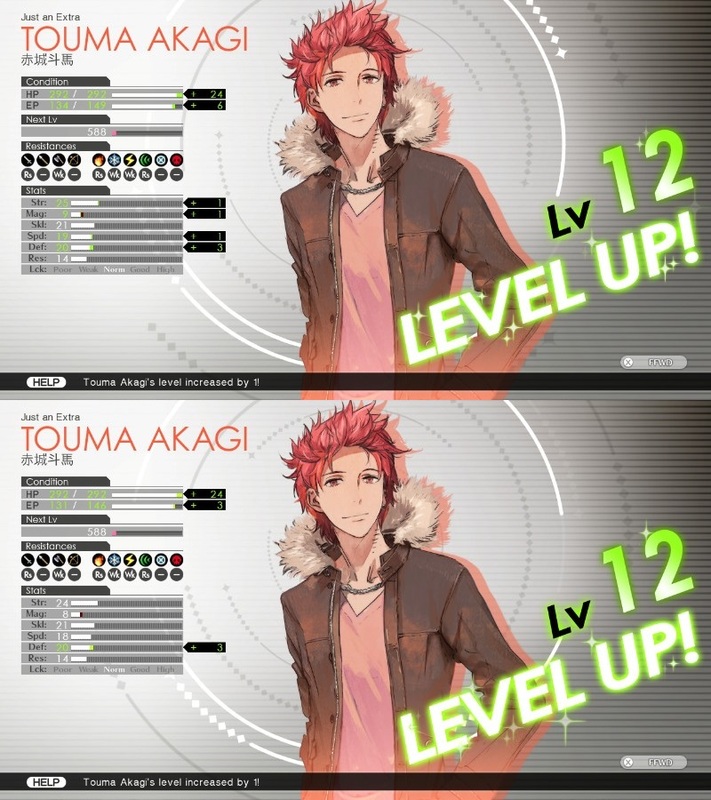 Stat growth on level up is randomized, much like the Fire Emblem series. Endearing characters go a long way towards making what otherwise could be a mediocre story into something much more engaging. Ultimately, the plot is somewhat cliché and straightforward, but the unique setting, style, and characters make it interesting regardless. The later game also shows more direct relation to the Fire Emblem series than one might initially expect. Mirage designs combine Fire Emblem characters with a design reminiscent of demons from Shin Megami Tensei, creating an odd effect of bizarre, otherworldly creatures that still bear a striking resemblance to their original forms. The ally Mirages are the most normal-looking, generally somewhat recognizable as the original characters, while regular enemies go far enough to be recognizable as Fire Emblem classes. This is particularly useful in combat, since the game uses the standard Fire Emblem weapon triangle – swords beat axes, axes beat lances, lances beat swords, bows beat flying enemies – often allowing you to get an easy first Session and expose more of their weaknesses. Bosses take more liberties with their designs, usually only bearing a thematic resemblance to the originals. The gray ones have been afflicted by the Mirage, and the colorful ones are normal. The visual design is very bright and colorful all around, at least in Tokyo, while the Idolaspheres are still colorful but with a more surreal style. 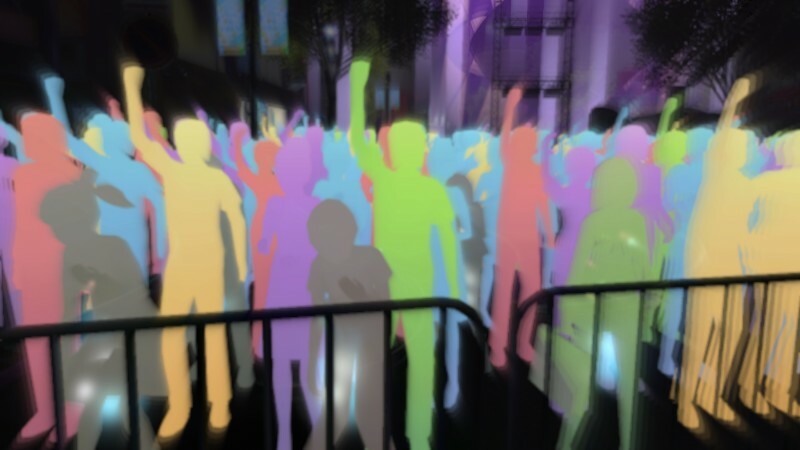 Crowds of non-interactive NPCs are normally shown as multicoloured silhouettes, which turn to grayscale following a Mirage attack. Sometimes the regular cutscenes are broken up by wonderfully-animated anime videos by Studio 4˚C, also known for doing animated scenes for Catherine, Asura’s Wrath, and Toukiden, among others. The anime scenes are reserved for the concert sequences and some music videos. The overworld designs have a lot of life and vibrancy to them, with the bright colors looking gorgeous on the Wii U. Combat is flashy and stylish, although it does experience some slowdown when fighting too many enemies at a time while using high-tier magic spells. The camera angles also sometimes obscure damage readouts behind the UI during longer Sessions. Although the game usually runs well, the load times leave a fair amount to be desired not only when moving from one area to another, but there are even a couple seconds of loading time when opening the Pause menu and submenus. It’s not a huge amount, but it makes navigating Tokyo and some Idolaspheres more frustrating and time consuming than it should be. I’m fine with games needing to install to the system, or having large downloads like with Xenoblade Chronicles X, if they could reduce the load times. The game also froze up completely twice while I was playing, both times while scrolling through Tsubasa’s in-game bio page. I don’t know why, but suffice to say I didn’t bother reading the bio updates after those incidents. The posters change as you go through the main story and side stories. When it all comes down to it, the biggest problem with Tokyo Mirage Sessions #FE is that it suffers from something of an identity crisis. Despite being a perfectly fine game in its own right, it doesn’t feel like it belongs in either series it claims to be a part of. The gameplay is a completely different genre from any Fire Emblem game, being a standard JRPG as opposed to turn-based strategy, while the tone, design and plot set it apart from anything within the very diverse MegaTen umbrella. The Fire Emblem link is more than just a superficial one, as it includes the weapon triangle, enemy and ally classes, simplified reclassing using Master Seals, and randomized stat growth on level up. Even if it does seem confused about what it wants to be, Tokyo Mirage Sessions #FE is still a game that can stand on its own merits. The combat is impeccably designed, and the story is solid with endearing characters. The soundtrack has some real gems, as well, and, ultimately, I enjoyed the 55 hours or so it took me to beat the main story and all side stories — not a bad playtime for $60 USD new. Beating the game once unlocks the New Game+ and Lunatic difficulty, as well as a harder version of the final boss. If you like non-standard JRPGs and have an interest in Japanese popular culture, I would recommend you take a look, one way or another. Review copy purchased by author.